Last year, there were more than 37,000 traffic accident deaths in the United States — an increase of 5.6% over the previous year, according to the National Highway Traffic Safety Administration (NHTSA). What stands out among these latest NHTSA findings? In 2016, there was a noticeable uptick in traffic accident deaths involving pedestrians, motorcyclists and bicyclists. There were 5,987 traffic accident deaths involving pedestrians across the United States in 2016 — an increase of 9%. This is the highest number since 1990. The spike in pedestrian accidents can be attributed to many factors, including more speeding motorists, distracted drivers and impaired motorists. Other factors contributing to the increase are that more people are walking and running these days, which is why an important part of pedestrian safety includes focusing on your surroundings, so you safely arrive at your destination. There were 5,286 motorcyclist deaths across the nation in 2016 — an increase of 5.1%. This is the highest number since 2008. In Michigan, the state Legislature repealed the mandatory motorcycle helmet law in 2012. Since that time, the number of motorcyclist fatalities has inched upward. In 2016, Michigan had 152 motorcyclists deaths. Of these, 78 bikers were riding without a motorcycle helmet. There were 840 bicyclist deaths throughout the country in 2016 — an increase of 3.1%. This is the highest number since 1991. Notably, Michigan bicyclist deaths increased 15% in 2016. In Michigan, bicyclists are legally entitled to use the roads and must follow the same rules as motorists. When it comes to bicycle safety, it’s important for motorists to remember that, when sharing the road with bicyclists, it’s not just a bike — it’s a person. When it comes to traffic accident deaths involving passenger vehicles, the 2016 numbers are the highest since 2008. Passenger vehicle deaths increased 5.1% last year, while SUV occupant fatalities rose 5.2%. There was also an 8.4% spike in van occupant deaths, and pickup truck fatalities jumped 1.5%. Another noteworthy finding? Semi-truck accidents and crashes involving other large vehicles increased by 5.4% in 2016. This is the highest number of deaths in semi-truck accidents and crashes involving other commercial vehicles since 2007. 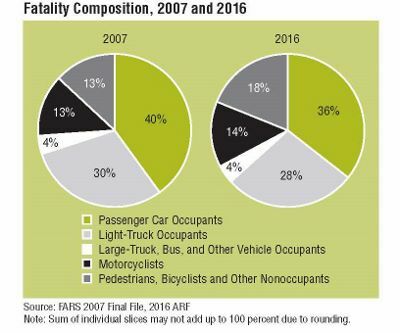 Notably, of the 4,317 trucking accident fatalities in 2016, nearly three-quarters were occupants of the other vehicles involved — not the truck. Unfortunately, 2016 also saw an increase in certain dangerous driving behaviors. There were 10,428 passenger vehicle deaths last year specifically related to not wearing seat belts. This is an increase of 4.6% over 2015. For those passenger vehicle occupants who survived fatal crashes last year, only 14% were unrestrained, compared to 48% who died. Driving while impaired accounted for 28% of the overall traffic accident deaths in 2016. Last year’s 10,497 alcohol-related fatalities were an increase of 1.7% over the 10,320 deaths in 2015. In Michigan, impaired drivers killed 940 people in 2016. It’s important to remember that, if you’re injured in a Michigan drunk driving accident, you’re entitled to receive no-fault PIP benefits. In addition, 2016 saw an uptick in the number of traffic accident deaths related to speeding. Last year, there were10,111 fatalities due to speeding, an increase of 4% over the 9,723 deaths in 2015. Notably, Michigan speed limits are increasing on certain stretches of highway. Recent studies have shown, however, that boosting maximum speed limits often leads to more accident-related deaths. Meanwhile, the NHTSA report wasn’t all bad news. On a positive note, the number of 2016 fatalities attributed to driving while drowsy decreased by 3.5% last year. And deaths in distracted driving accidents decreased by 2.2% in 2016. If you’ve been injured in a Michigan car accident, Sinas Dramis can help protect your right to no-fault PIP benefits and pursue an auto negligence claim against the at-fault driver. Our attorneys also have decades of experience handling Michigan wrongful death claims, particularly those involving motor vehicle collisions. Contact our Lansing car accident lawyers or Grand Rapids auto accident attorneys today for a free initial consultation.